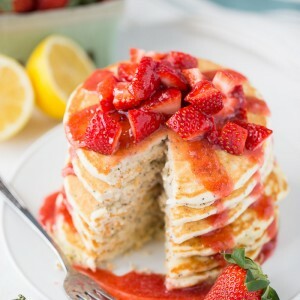 Delicious Lemon Poppy Seed Cake topped with almond glaze! 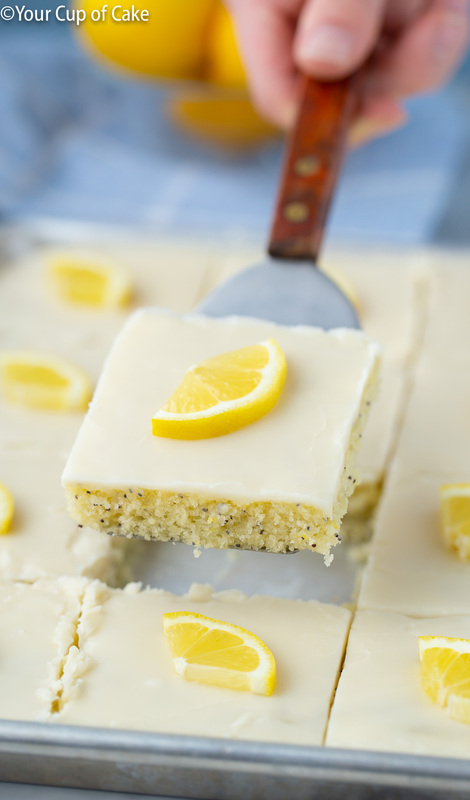 This Lemon Poppy Seed Sheet Cake is perfect for parties and serving a big crowd! Whenever I serve it people go back for seconds and LOVE it! 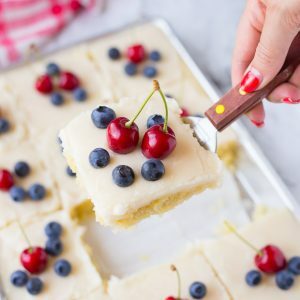 Sheet cake recipes are a must to have! You need a really good chocolate one and a really good non-chocolate one… so here you go! 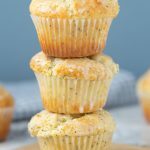 This recipe is incredible and incredibly easy! 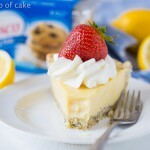 It is my go-to recipe all summer long! 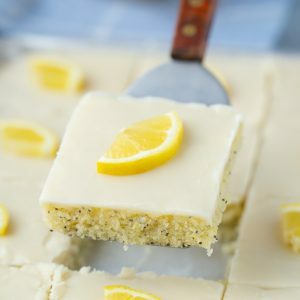 The lemon cake is spotted with poppy seeds and perfectly moist (sorry for people who hate that word) and zingy. 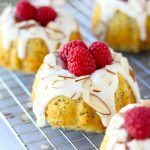 The almond glaze sinks into the cake just a little bit and gives it that perfect balance of sweetness and hint of almond. 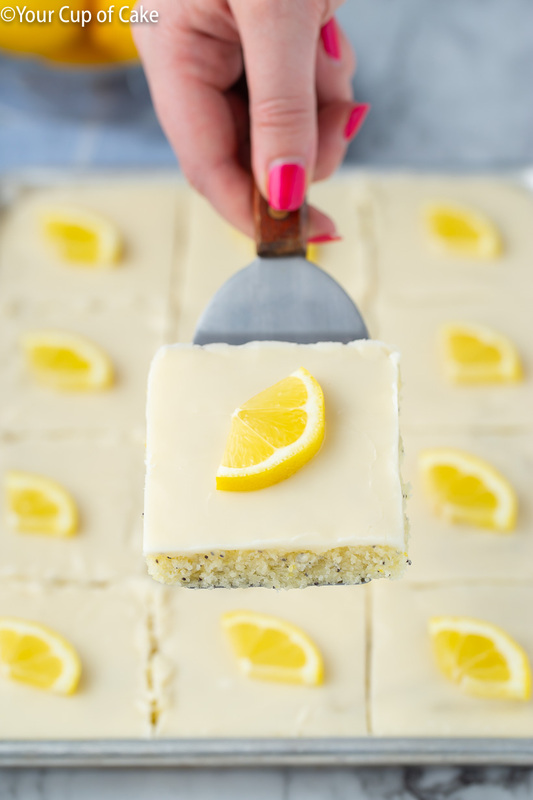 After making this Lemon Poppy Seed Sheet Cake just once you’ll be finding excuses to make it every week! This really is (in my opinion) the best sheet cake ever. I’m truly obsessed with this recipe and whenever I serve it at a party people are begging for the recipe, going back for seconds and then upset when it’s gone! There’s a few fun ways to play around with this recipe too, which makes it perfect for any occasion. 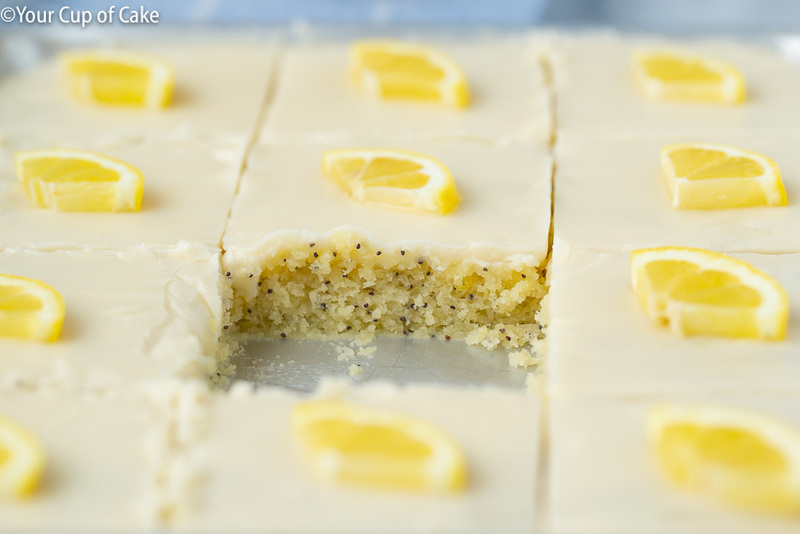 This Lemon Poppy Seed Sheet cake can be made without poppy seeds and without an almond glaze. 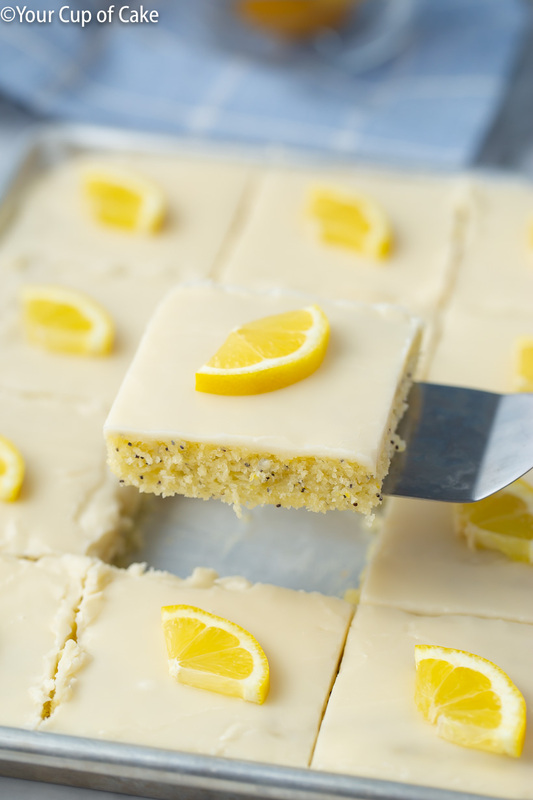 It could be just a regular lemon sheet cake if you want! 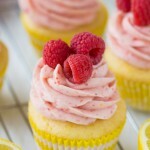 You can dress it up with berry slices or make it more kid-appealing with sprinkles! The first time I had this cake was at my own bridal shower and it was the most perfect dessert. The host cut little slices and it paired perfectly with the food, cute and dainty! 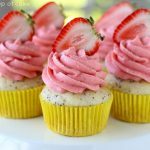 I first shared this recipe last year as a fun 4th of July cake! See how I made it gorgeously patriotic with fruit and no dyes! 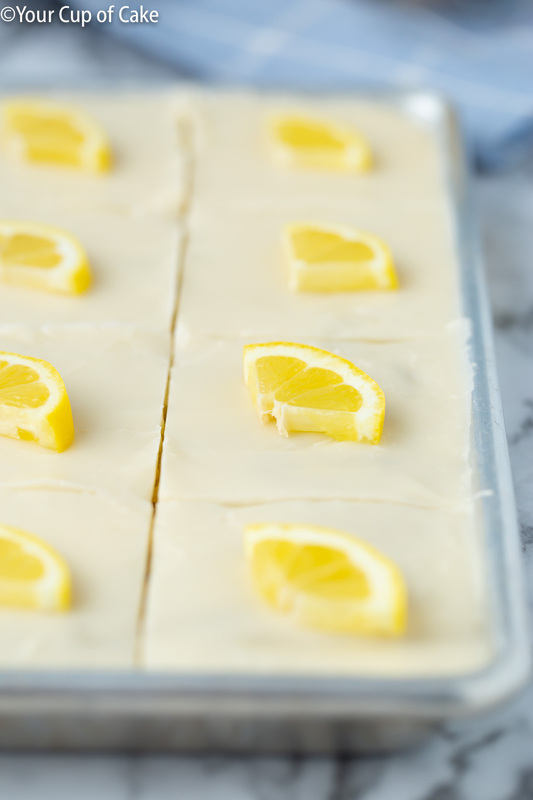 I’m seriously SO close to going into my kitchen right now and making another one of these lemon sheet cakes! The photos are making me drool! 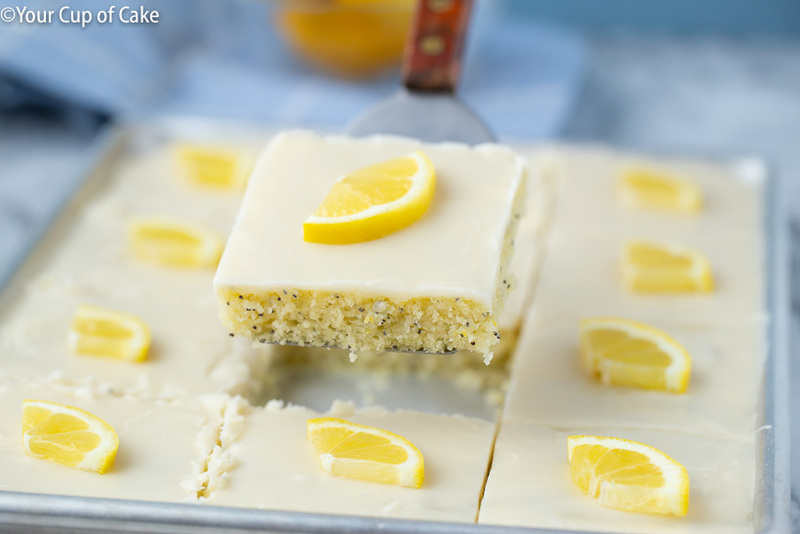 This Lemon Poppy Seed Sheet Cake is the perfect dessert to make for a crowd or a big potluck! First of all, it feeds anywhere from 24-48 people depending on how large you cut the slices! It’s a perfect dessert to even make the night before your party, the glaze on top seals in the moisture so the cake won’t dry out any time soon! It’s easy to serve once you get to the party and it’s really easy to transport in your car! If you are making this the night before, my once suggestion would be to wait to top with any fruit until you arrive to the party! Juices sometimes seem out of fruit and into glazes. Sheet cakes, like this one, are usually made on rimmed cookie sheets! I sometimes swap a normal sized pan for two of my mini (quarter sized) pans when I shoot recipes so I can give extra’s away easier to families in my neighborhood. So if you’re looking at these photos and wondering why you only see 12 slices, it’s because I actually made two smaller cakes. Preheat oven to 375 degrees and grease a rimmed cookie sheet (I used 2 mini pans for my photos). 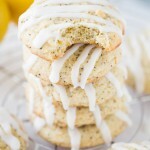 In a large bowl, combine flour, sugar, baking powder, baking soda and poppy seeds. 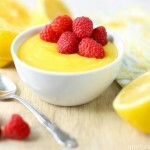 In a small bowl, whisk together eggs, sour cream, lemon zest and vanilla extract until smooth. Pour into pan and bake for 18-22 minutes or until and inserted toothpick comes out clean. FROSTING: While the cake is baking make frosting. Add butter to your sauce pan (the same one you melted the other butter in) and milk. Bring to a boil. Pour into a bowl with vanilla extract, almond extract (optional) and powdered sugar. Whisk until smooth. 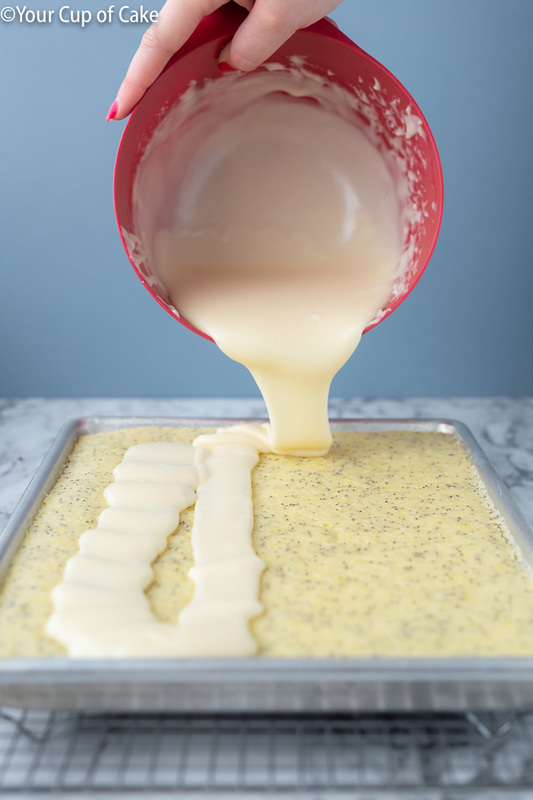 Pour frosting over your cake right after you pull it out of the oven and spread smooth if needed! Eat warm or let cool. Top with berries, lemon slices or sprinkles! Feeds 24-48 depending on how large you cut the slices!